Fox News CT & Building 7: Fair & Balanced Coverage of 9/11 Truth Graffiti? A suprisingly balanced approach to the subject of 9/11 truth graffiti on Connecticut highways. 9-11 Veritas @ Harvard University : "The Fictional Basis of the War on Terror"
presentation "The Fictional Basis of the War On Terror". Brain Pop is a very popular online educational source in public and private schools. I encourage you to also get a trial membership and watch the ' Terrorism' video, which they also played after this video at my child's school. Its duck and cover for the ' War on Terrorism " generation. Fortunately my child is smart enough to know BS, when she sees it. She said she was just waiting for them to explain Building 7, but they never mentioned it. She said it best, " Its like a lie that has gotten so big that no one even knows their lying because no one ever talks about the truth..they haven't even heard it ...so its not really lying,... I guess... just not educated....which is pretty sad because they are supposed to be educating me ." 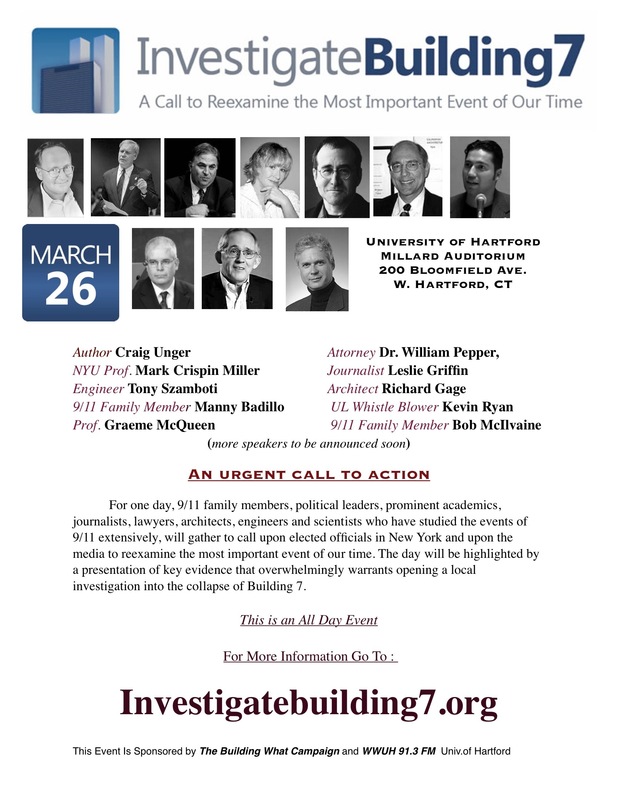 In this 20 minute heartfelt appeal to action Richard Gage, AIA , founder of Architects and Engineers for 911 Truth, lays out the history of AE911Truth, where it hopes to go, and how you can help to get it there. The Third in A Three-part Presentation : "The Case for a New Building 7 Investigation"
The Second in A Three-part Presentation "The Case for a New Building 7 Investigation"
This presentation will examine the attempts by government-sanctioned investigations to provide a theory for the fire-induced, non-explosive destruction of World Trade Center Building 7. In particular, the presentation will cover the process of investigation conducted by NIST and the final explanation given by NIST for initiation of collapse. NIST's concept of fire-based collapse initiation will be scrutinized in light of the publicly available evidence. Those using the material for broadcast and video production should use the 96kbps versions. For personal iPod listening, the 48k versions are fine. For those who don't know, radio4all.net is used by community radio producers worldwide to share audio. It has an anarchist philosophy and there is no restriction or censorship except for copyrighted material. Anyone can download and use this material as specified by the Creative Commons license each producer chooses. A huge thanks to John Schwenk for posting this and for mastering all of the audio feeds at the event. Even though World Trade Center Building 7 is said to have been the first steel-framed building in history to undergo total collapse due to fire, there were many people who knew the building was going to collapse long before it did. In this presentation, the evidence for this peculiar foreknowledge will be summarized and its significance discussed. The argument will be made that it is impossible to explain this foreknowledge on the basis of the collapse hypothesis offered by the National Institute of Standards and Technology (NIST). The only hypothesis that explains this foreknowledge is the controlled demolition hypothesis. Gothamist Covers March 26th W. Hartford Event and Building What? In a stop story, The Gothamist covers the March 26th event in West Hartford Ct., and includes original Building What? Campaign commercial. Please join us for what will certainly be an historic event. "9/11: Press For Truth" will be played through out the week as part of Link TV's on going pledge drive. Call in a pledge and let them know you appreciate them covering questions surrounding the attacks of 9/11, and maybe suggest some other 9/11 films. "Link TV is a non-commercial American satellite television network providing "diverse perspectives on world and national issues." It is carried nationally on DirecTV and Dish Network. Link TV was launched as a daily, 24-hour non-commercial network in 1999. It receives no money from the satellite providers, but relies instead on contributions from viewers and foundations."